Guest bloggers Dr. Alex Oberle and Mollie Ullestad represent the Geographic Alliance of Iowa (GAI), a National Geographic-supported organization that works to advance geography education in Iowa. Alex is an Associate Professor of Geography at the University of Northern Iowa and the Coordinator for the GAI. Mollie is a Geography Education student at the University of Northern Iowa and the Undergraduate Research Assistant for the GAI. Your average university mascot and elementary school kid have something in common: Neither seems to sit still for very long. But at South Hamilton Elementary, these aren’t your average 5th graders or humans in animal costume. There’s no squirming or shifting now. The pep rally is over, the high-fives are done, and the stickers have all been passed out. It’s down to business as an 11-year-old Kid Explorer, the adopted name of 5th grade students at South Hamilton Elementary, presents his first-ever research paper. It’s about a big cat species, and it is outstanding. 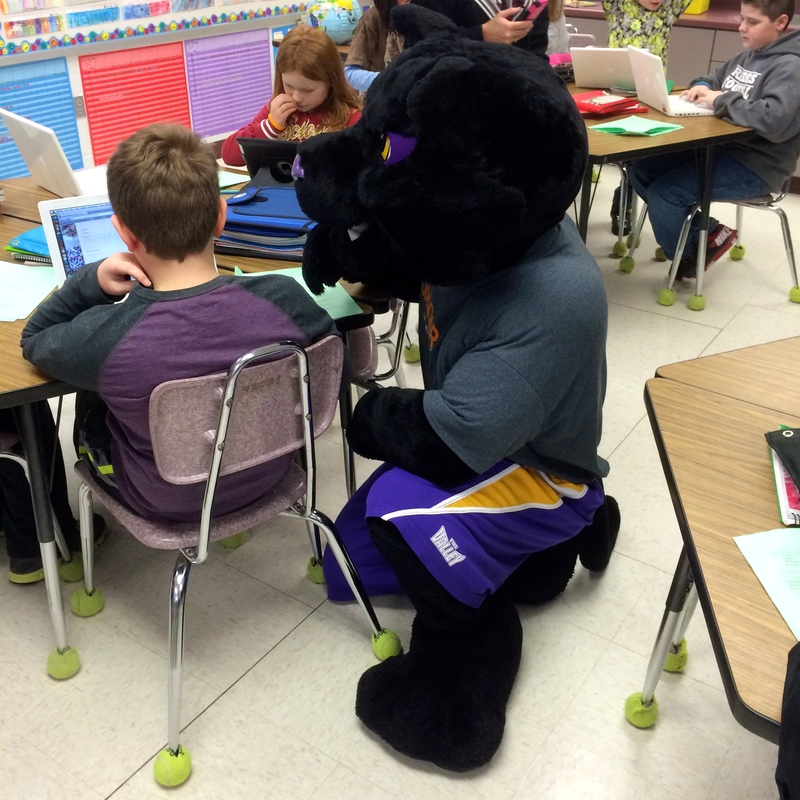 The Cat (TC) and The Kitten (TK), both panthers and mascots at the University of Northern Iowa, sit to either side while the Kid Explorer shares his newfound expertise on habitats and habit, distribution and diet. The Kid Explorer isn’t the only one with laser-like focus: Even the mascots are zoned in and have probably just set a NCAA mascot record for consecutive minutes without messing with somebody’s hair, throwing some “bunny ears”, or any other form of mascot mischief. Quality work and passion for a research topic have a way of capturing everybody’s attention. Amid mascot antics and research projects, the National Geographic Big Cats Initiative took center stage at the small-but-mighty South Hamilton in Jewell, Iowa. The school’s annual reading week was themed “Save the Big Cats,” and classrooms participated by decorating their doors and recreating big cat ecosystems in the school library. There were even school lunches throughout the week with names like “Roaring Rib Sandwiches” and “Cougar Caesar Salads,” and big cat dress-up days to boot. 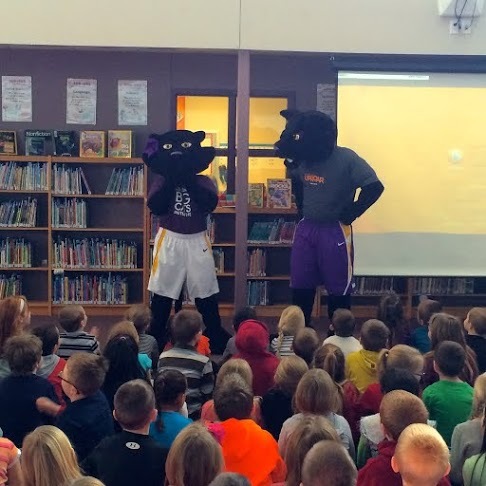 To kickoff the week, TC and TK visited South Hamilton, where, wearing National Geographic Big Cats Initiative shirts, they gave students high-fives and took pictures for the local newspaper. The students loved interacting with “real” big cats. This mascots were a huge success and drew community-wide attention to the plight of big cats around the world. The event furthered the cause of the Geographic Alliance of Iowa—to instill in the minds of Iowa students that they can make a difference—and created connections between an Iowa school, the University of Northern Iowa, and National Geographic. TC and TK have passed the torch to the University of Missouri’s Truman the Tiger. Stay tuned to see his work for the Big Cats Initiative. We thank the teachers, staff, and students at South Hamilton Elementary for their willingness to participate in this project. Without their efforts it would not have been such a success! Good luck to the Kid Explorers as they continue with their research projects; through them we believe in the power of science, exploration, and storytelling to change the world.